Albert Seaborn passed away on 12 October 2013 and left his loving wife Dorothy and a devoted family behind him. Albert and Dorothy were always to be found at the George Formby Society conventions, in their regular place on the front row and in over twenty years, they rarely missed a Blackpool event. 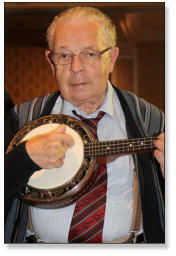 Albert played the banjo uke but would only get up in the 'thrash'. Nevertheless, he was a staunch George Formby fan and a very enthusiastic member of the GFS. Albert and Dorothy had many friends within the Society and were a very popular couple. Some of us attended their 60th wedding anniversary in 2011 and entertained his friends and family. It was a real pleasure to be with them on this very special day and to help to make the night a big success by entertaining Albert and Dorothy and their guests. It was on this occasion that I noticed from a display of photographs of their lives together, that Albert was also a keen racing cyclist in his younger days. Albert reached the marvelous age of 86 and shared a wonderful life with Dorothy. Albert never craved attention and he and Dorothy would just sit in our audience at Blackpool and quietly enjoy the other entertainers. A very modest man, I did not learn until his death that he held senior positions in the engineering industry and also lectured on engineering design at Salford University. I am told that he was very well educated (which was obvious) and was an excellent mathematician. He was always a sportsman and enjoyed his cycling, boxing and football and was a keen Manchester United fan. It was said by a member of Albert's family that Dorothy was Albert's number one love - but for many years the George Formby Society ran her a close second! Albert will be much missed by all who attend to the Blackpool conventions - but we all sincerely hope that Dorothy will continue to take her rightful place on the front row in the Imperial.